Ah, it’s a great time to be a Marvel fan! What? No, they haven’t fixed the dumpster fire on the comic side of things, but we’ve got some amazing trailers for Deadpool 2 and Infinity War, I just picked up the Blu-Ray of Thor: Ragnarok, and I’ve got enough Marvel Legends figures to keep me happy for the foreseeable future. 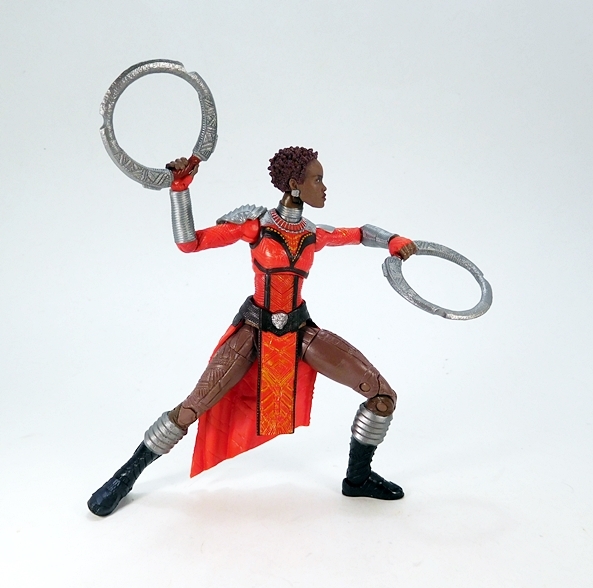 Today I’m pressing on through the Okoye Wave and opening up Nakia from the spectacular Black Panther movie! Nakia, not to be confused with that brand of famously indestructible Finnish cell phones, Nokia, comes in the typical Legends window box. It’s got some great character art on the side panels, the back panel shows you the rest of the figures in the wave, and the window on the front lets you get a look at all the goodies inside the box. 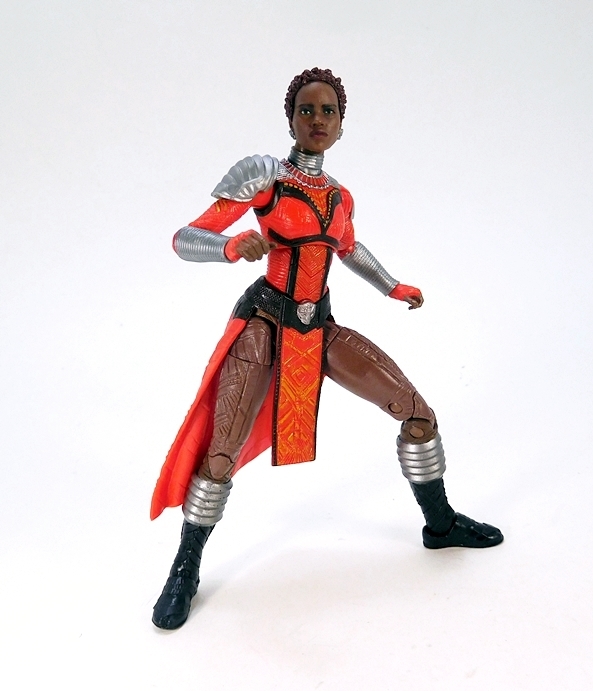 I really enjoyed Nakia in the film, and I’d love to see them explore her character further in the next one, particularly her background with the Dora Milaje, and boy would it be cool for them to work the Malice storyline into it. I can practically see that whole thing unfolding on the screen and it would be awesome. And here she is out of the package and looking fabulous. Black Panther was a visual feast, and a lot of that came from the pageantry of the Wakandan costumes. 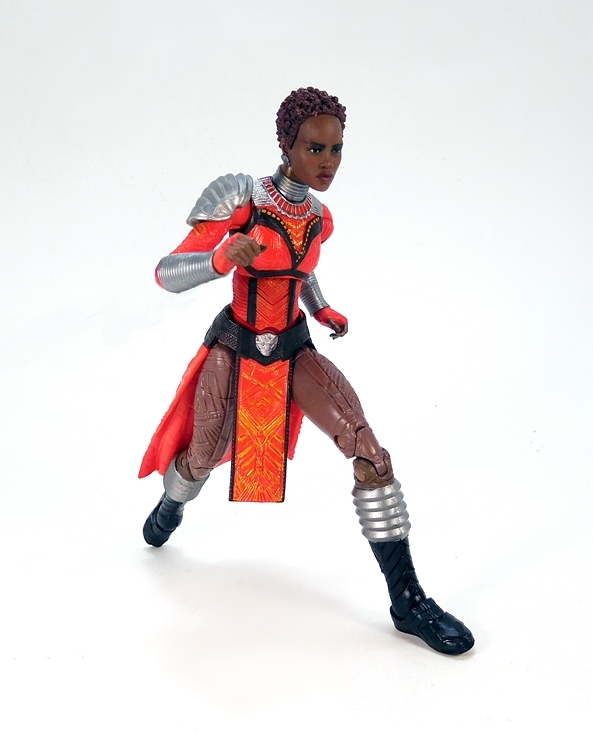 Hasbro had a lot to work with when it came to Nakia’s outfit and I think they did a bang up job with it. 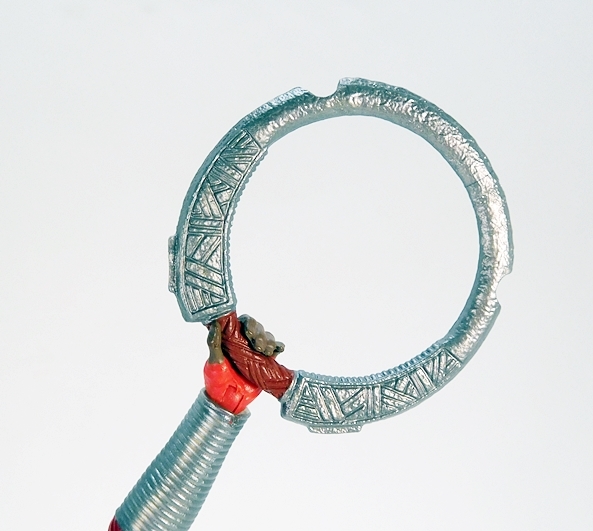 The top of the red tunic is part of the buck, while the lower half is part of the belt, sculpted in soft plastic, and extends down to hang down the front and back. The effect works really well, and it’s pretty convincing as being one plastic garment. There are a ton of cut lines running throughout the tunic, forming various geometric patterns, some of which are picked out by gold paint. 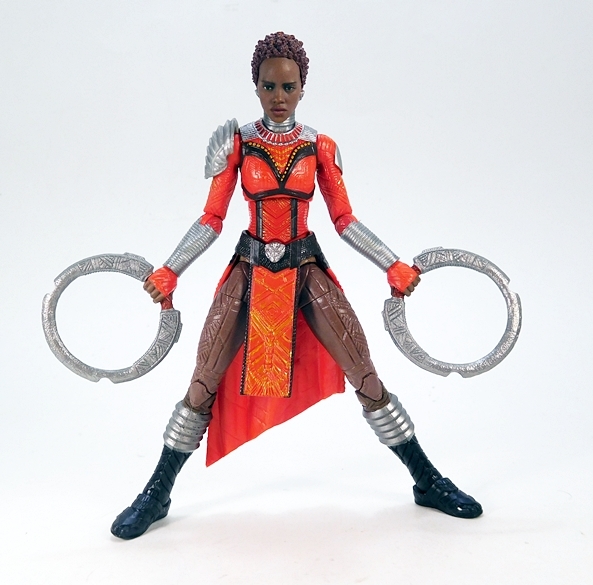 On top of that you get long segmented bracers on her forearms, a large piece of armor on her right shoulder, a smaller piece on the left, and some sharp detailing around her neck, all painted in silver. She also has a sculpted silver belt buckle that looks like a panther emblem. This is some fantastic stuff! My only nitpick is the legs, which are painted to look like they’re supposed to be bare, but have a lot of the same ornamental cut lines running throughout. Just looking at them makes me wince, because it’s like she went through some kind of ritual and had these carved into her flesh. 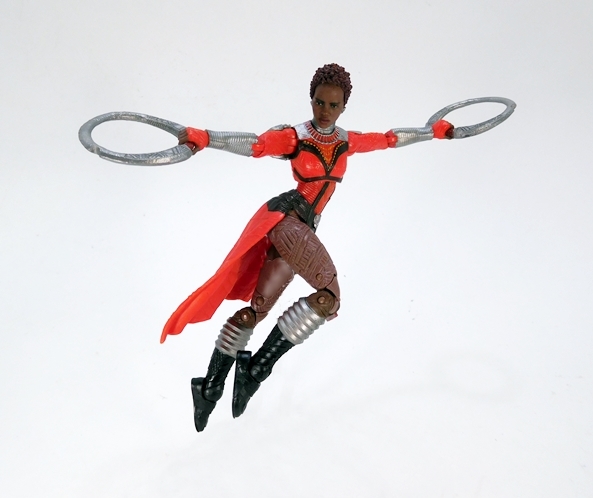 I’ve only seen the movie twice now, but I don’t remember this being the case, and I haven’t been able to find any reference shots of her costume showing it either. In fact, it looks like she’s just wearing some fairly plain leggings. 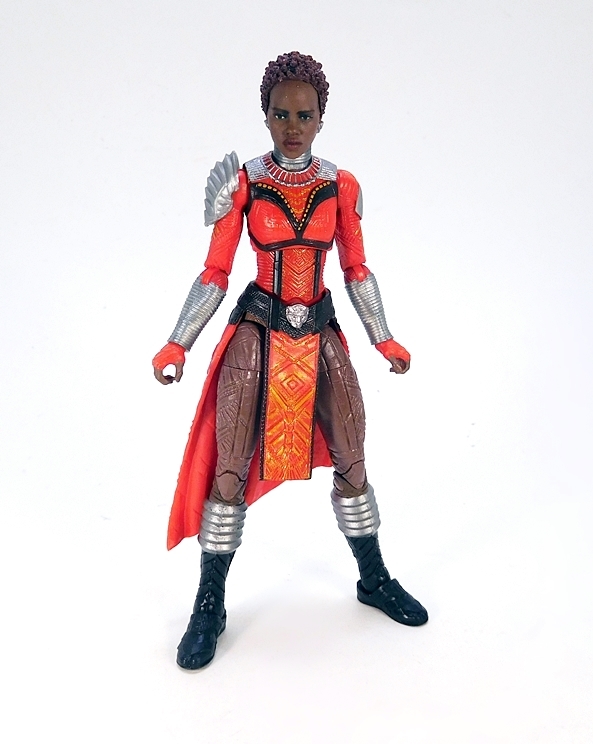 Okoye’s costume does have these designs, but they’re part of her leather leggings. Anyway, her ensemble is rounded out by a pair of black boots, with some accordion style rings on the top, which look a little clunky, and throw off what is an otherwise pretty graceful figure. 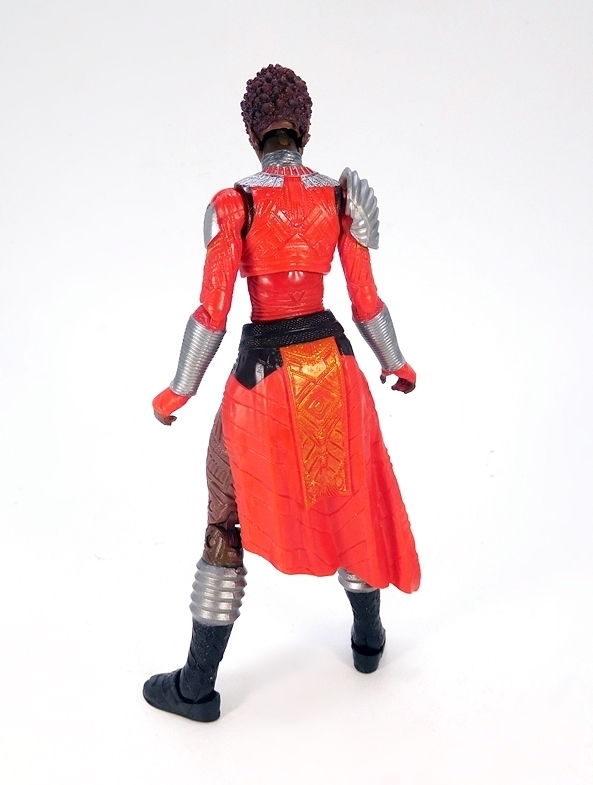 If it sounds like I’m coming down on this figure, keep in mind, these are just nitpicks, and I think the sculpting and coloring on this costume look outstanding. Also outstanding is the head sculpt. 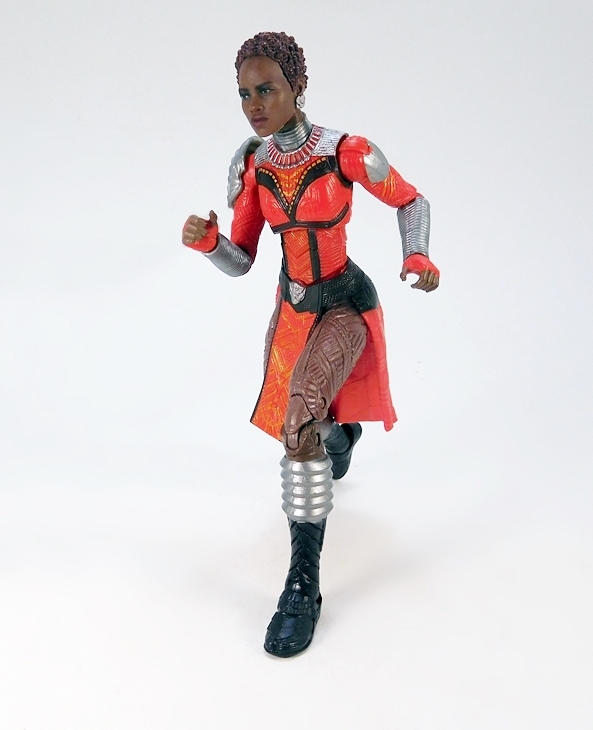 More often than not, Hasbro has been on point with their MCU head sculpts, but they’ve really upped their game recently and this is another great example of that. 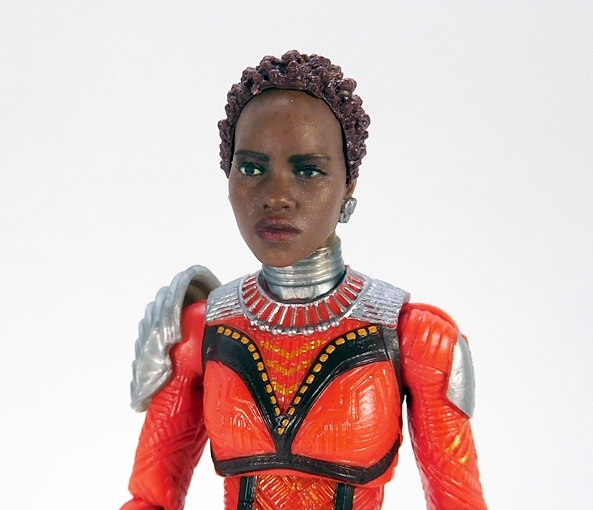 The likeness to the lovely Lupita Nyong’o is certainly there. 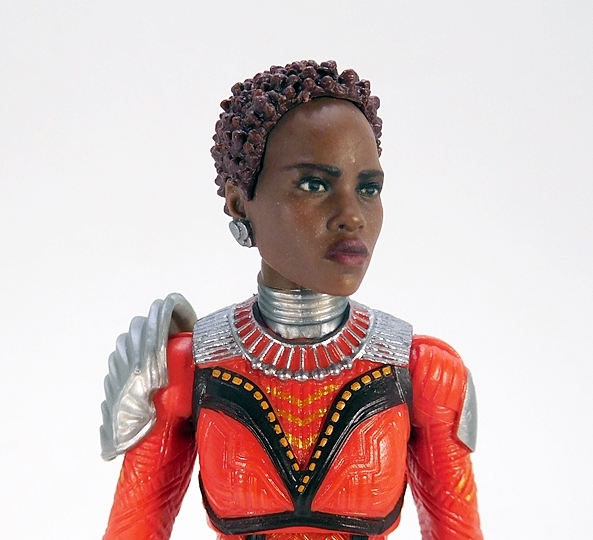 Granted, I prefer it when she’s smiling, but the stern and solemn look here is more appropriate for the character and action figure. They did an amazing job sculpting her hair and she even has her tiny earrings. 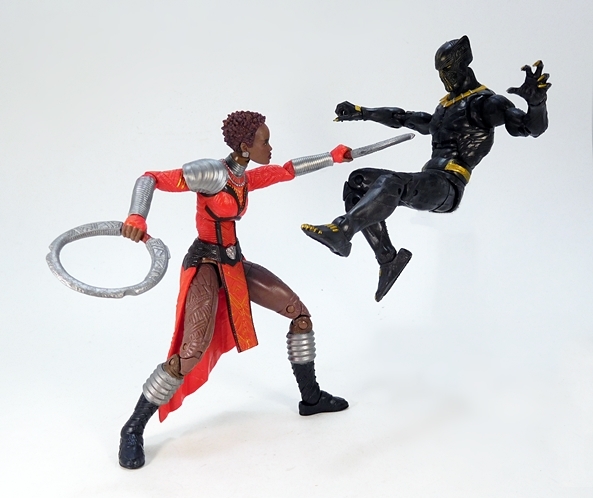 The articulation here is what I’ve come to expect from my Legends MCU ladies, which means good, albeit not perfect. I would still love to see Hasbro go with double hinged elbows and bicep swivels in the arms. Instead, we get the typical rotating hinges in the shoulders, elbows, and wrists. 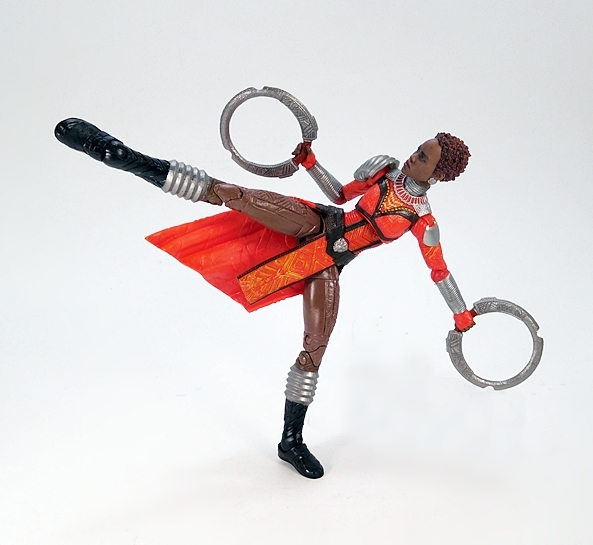 The legs fare a lot better, with ball joints in the hips, double hinges in the knees, swivels in the thighs, and both swivels and rockers in the ankles. 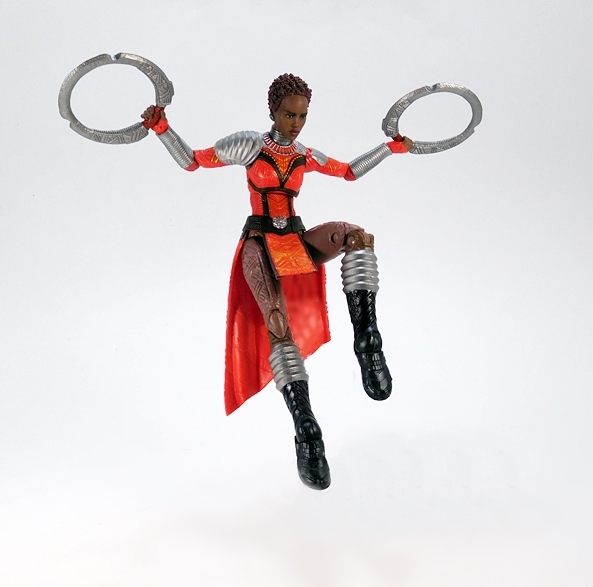 There’s no waist swivel, but she does have a ball joint under the chest, and she has both a hinge and ball joint in the neck. 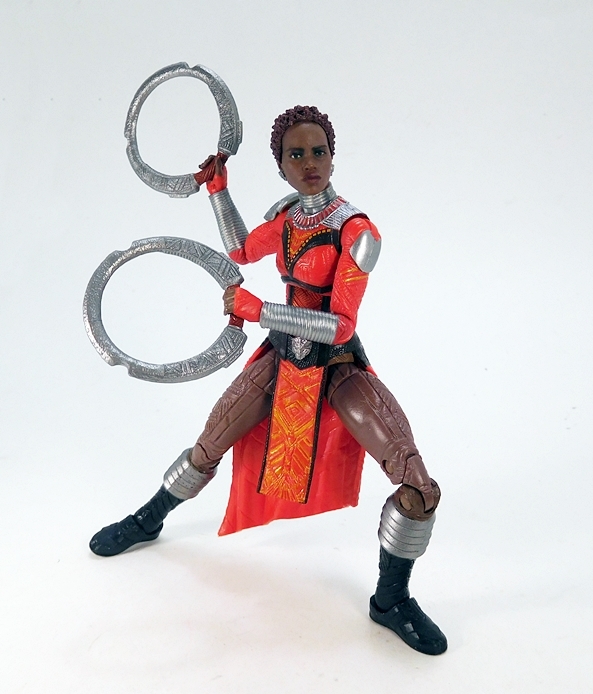 In addition to the BAF parts, Nakia comes with a pair of Chakram, which as far as I knew were generally from India, but I’m not going to quibble about it because they’re exotic and cool and movies often play it fast and loose with historical authenticity. Anyway, these are beautiful accessories, with brown textured grips to simulate wood or leather, and silver blades with decorative inscriptions scultped into them. 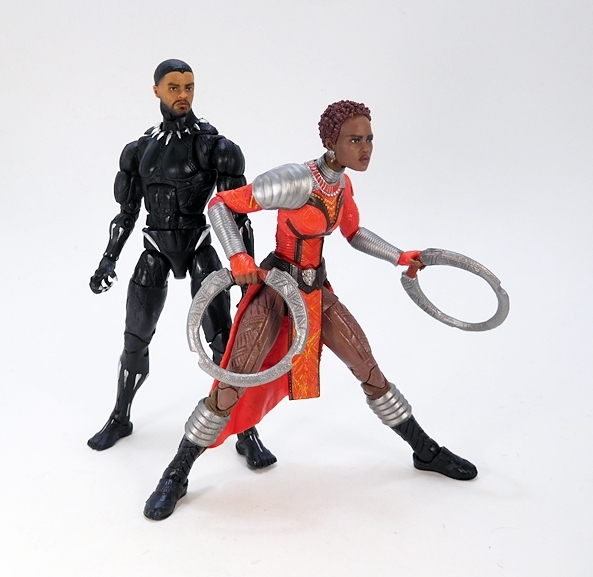 Black Panther and Killmonger were both great figures, but lets face it the black with gold and black with silver suits didn’t really showcase the movie’s colorful costumes. 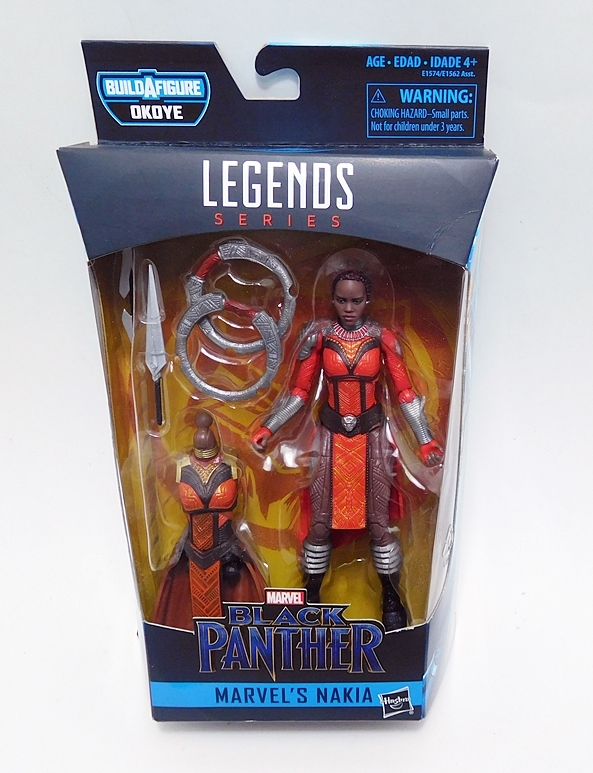 With Nakia, we finally get to see some of that translate to plastic, and it looks superb. 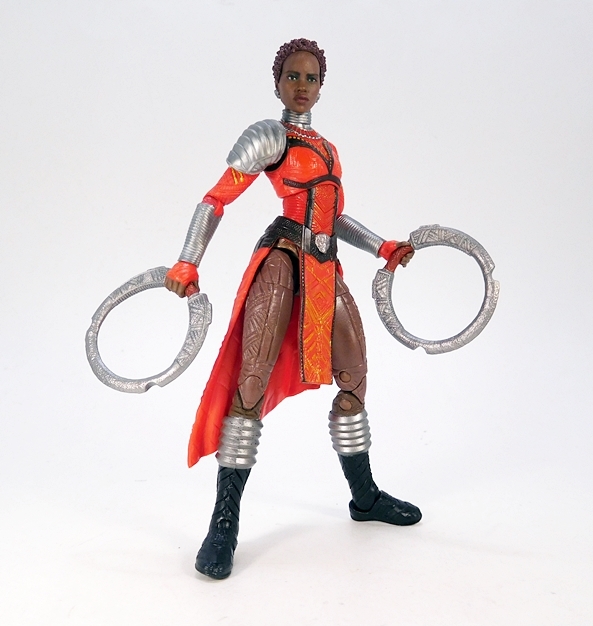 I nitpicked some of the liberties Hasbro seemed to take with the costume, but really I have nothing but love and admiration for the work they did here. 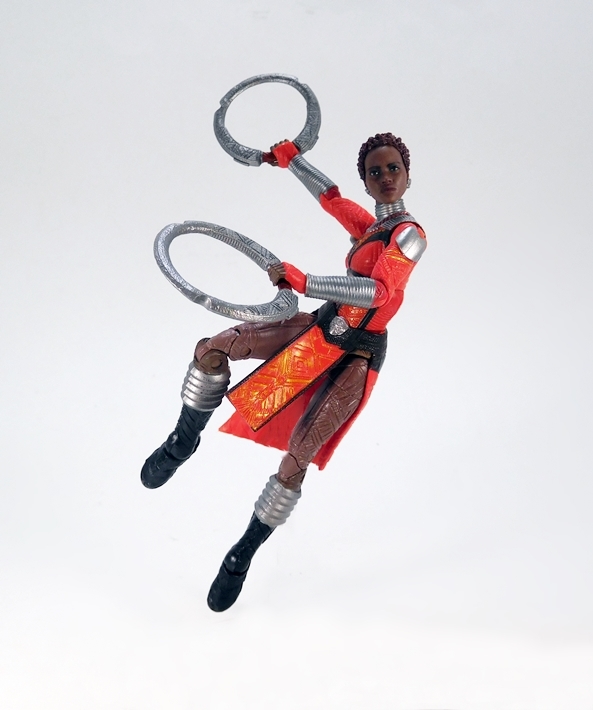 From the exquisite costume, to the beautiful likeness, to some really fun accessories, this figure has it all. And that’s it for the packaged MCU figures. 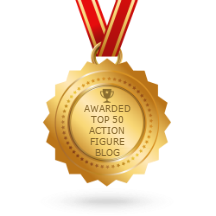 Next week, I’ll start in on the comic-based figures! Hehe. I liked the mobile phone remark. Yup. Bork bork bork ikea saab…. Oh wait, that’s not Finnish.